If you are worried about getting a secured network connection while surfing the web, you might want to consider looking for a virtual private network. Using VPN will give you that secured connection you need because what this does is to make sure that you are keep in the dark from everyone else. Your IP address is hidden from all website servers and no one can detect your security network meaning, it�s only you using that network making sure you are completely safe while online. 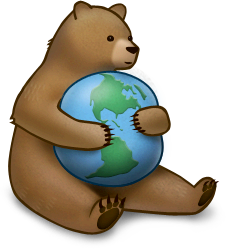 Choosing Tunnel Bear VPN could be a great option for you. You might not be getting a money back guarantee from this computer but then again, you are only paying out five dollars � just under that a month so it�s not a lot of money to pay out for one month�s worth of VPN usage. Even if you don�t like this particular option after your first month, you can look elsewhere � plus it will protect the company also. However, the Canadian company does offer two IP choices � American and British, both are of course very popular. However, Tunnel Bear might not be so great in terms of offering certain things. When it comes choosing between PPTP, L2PT and Open VPN, there will only be one option � and it is the same with IP choices. You can only choose a Shared Dynamic IP option which is why you might be very disappointed with Tunnel Bear but if you don�t want to be overloaded with so many choices then Tunnel Bear could be best for you. Tunnel Bear can run with the operating systems of Windows and Mac OS X and it does look good on paper but you should try this out yourself to really know whether this is the best option for you or not.